-- I definitely want to get better at the craft skills involved - there was not much I actually had to learn to make it, but the things I did know were rusty from disuse and the 3D iteration does make a difference in some aspects. -- Even before I finished making chibi-Cthulhu (as seen in icon) from someone else's pattern, I started getting niggling ideas about design myself. I did not feel quite ready to launch into creation, but I felt that a little more practice would get me there. 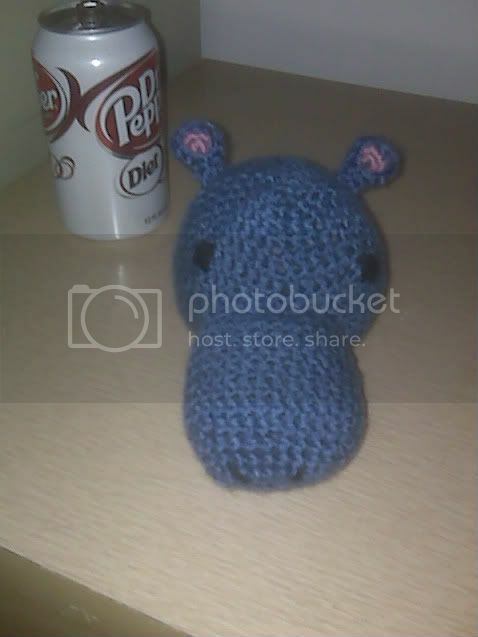 -- After intermittent google searching I found a pattern for a hippo that caught my attention. It might have been the purple yarn in the model, since purple has at this point mostly devoured my soul, or it might have been the name of the pattern, as I was immediately tempted to make four of them in different colors, arrange them along the cardinal points and feed them marbles. With my luck, though, I would end up with tons of uneaten leftovers. -- By the Friday before Easter I had interacted with the new toddler in my life enough to finally realize that I now know a small person who, if I made a toy, might really play with it. Not that we grownups can't have stuffed toys, but kid playing is in most cases a much more immersive experience, and I guess it was thinking of that that finally made it click for me. -- Circles are very versatile. Every part but one was based on a circle or a ball, and that one, the snout, was based on an oval. Even the ears are small flat circles folded in half and then with the bottom sewn shut. In conclusion, circles. -- My understanding of the Magic Adjustable Ring technique for starting said circles, learned for the first toy, expanded with more practice - there were three of them in Chibi-Cthulhu; the hippo has eight of them. It was a little difficult to learn, but it's so very worth it. -- My yarn tension (FYI, that's a crafting term, I am not confessing fiber anxiety here) may cause the project to have variances from the original even if I follow the pattern perfectly and get all the shaping right. Actually, I already knew that one from making baby Cthulhu. It's only "may" because it could also be using a smaller hook size, which affects gauge (stitches per square inch). I don't really care about gauge for a project like this, though - in items that are all of a piece and don't need to be a particular size, what matters is that it's consistent throughout. I would like to test for it, though, by making the pattern again with a larger hook. -- This served as a great example of just how much the human brain will fill in on an image given the basic materials of lines and simple shapes. Without the ears? Totally a duck-billed platypus. I put on the ears and OMG HIPPO. -- The small details can make a project. The pink insides of the ears were my own contribution, not a part of the pattern, and they increased the squee factor for me by at least, oh, three times (because it's so measurable, right?). -- Check that the pieces being attached to the body are properly oriented in relation to each other before finalizing the attachment, because the only way to get them off after that is cutting them off, which risks all the work, not just the poorly placed parts. Poor Mr. Hippo can't stand up because his front legs are too far back. Fortunately, 1 year old kids are not the harshest critics of aesthetics, so my having a learning curve here is ok.
-- It has been YEARS since I braided anything, and it took a couple of false starts for my fingers to remember. -- Play with the toy a little bit prior to delivery to make sure none of the "handmade charm" is actually a fixable error. *chuckle* I loved that his head wibbled, but I realized that it was wibbling a little more in one direction than the other - but he'd already seen it and I was not about to take a toy away from a sick 1 year old. Besides, it WAS cute, and it 's a mark of my learning curve, so I have no regrets. 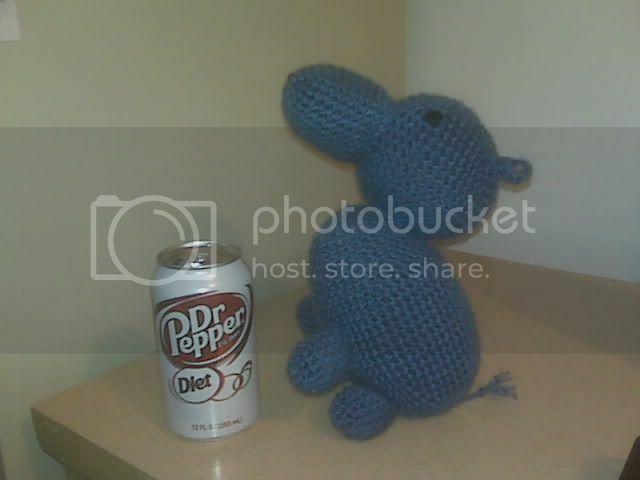 Friday afternoon I delivered him to my little buddy who obligingly squoooooshed the squooshy hippo for me. I told his mom that even if he never touched the doll again, it was 100% worth making just to see that. OMG, I might die of cute. What an adorable way to go! So cute!!! Your post makes me happy. I want updates on the other (yet not publicly mentioned) project! It is forthcoming! For some reason this particular kind of post just takes forever to write. I like having the same thing for scale every time. 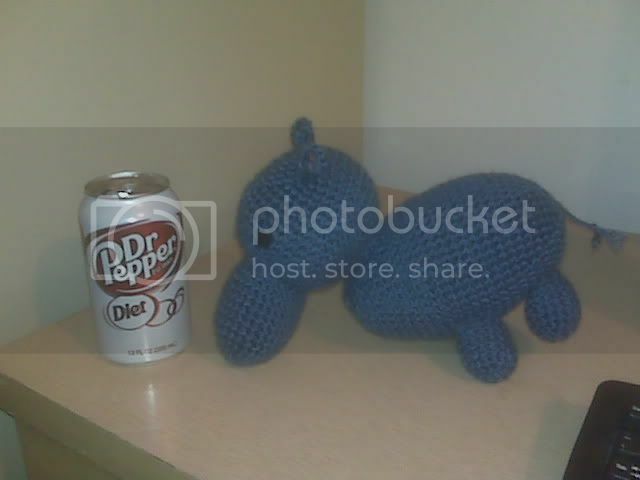 :) Besides, all members of the animal kingdom would like to be a Pepper!